Mensusa https://www.mensusa.com/articles/classy-and-exclusive-burgundy-blazer-for-funky-parties.html Classy And Exclusive Burgundy Blazer Appropriate For Formal And Funky Parties Want perfect party or funky outfits to flourish your wardrobe? High-class burgundy blazers, red blazers, and men's royal blue blazers are perfect choices. Dressing for a formal or a funky event means making a good impression and is conveyed by dressing up for the occasion and looking smart. Burgundy Blazers are superiorly designed with a contemporary construction made from wool or polyester fabrics that marks it as a perfect suit. These coats are available in several designs like slim fit, single-breasted, and double-breasted. However, the most eminent design is the two-button notched satin lapel coat. 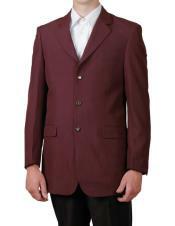 Most well-made burgundy blazers will match any official or casual outfit while imparting a classic look to the wearer. They also fit with different colors and in all seasons and still remain style conscious and decent. We stock the latest varieties of burgundy blazer with different colors, sizes and designs. To grab one of these at a reasonable price, visit our mensusa.com stores or hit us online. Your dress code tells much but you and carries some personal message with it. No matter how decent or explicit a blazer seems, a perfect color choice will intrigue a sharp and net outlook. Although many men associate the purple color to the feminine aspect, there are still bold and courageous men who wear this men's purple blazer as a sign of rationality and to take advantage of its versatility. The engrossing look portrayed by this blazer has seen it become a trending outfit and a favorite among men. 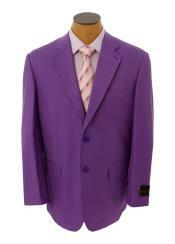 These purple blazers feature a timeless stylishness that will never embarrass your decency. They are mainly made of cotton wool and polyester fabrics. These are available in mensusa.com stores today in various designs, sizes, and styles at cut-rate prices. Supplement your dressing with yellow blazer men outfit. Most men's dressing seems so predictable and turns out to be monotonous and thus need to supplement styling that will enhance more unadventurous looks. 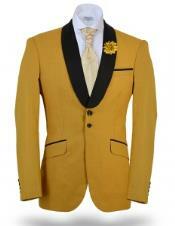 Yellow blazer men covering seem the best choice to flavor your apparel and improve the pop of pigment. Yellow color naturally blends with other colors delivering the fashion advancing trend and savvy. These soft cotton blazers are meant to boost men's casual look as they fit with simple jeans outfit, T-shirts, or other casual menswear. It also adds to your office look by completing the global effect with their decorative appearance to form a perfect match that adds individuality to your look. Most of these are lightweight blazers with soft interior lining for comfort, attractiveness, and suitability to hot weather. Our blazers are made with originality and multiplicity to cater for various sizes and design. They are also custom-made to fit men of different body sizes and personal tastes while offering a favorable price that matches your pocket. A red blazer is a perfect outfit that embraces a romantic look when appropriately groomed in special occasion like weddings, Valentine's Day, and proms. This outfit symbolizes love and affection to those that you hold dearly be it your fiancÃ© or relative. It features superiorly crafted design made from wool or polyester. Most of these come in various types from slim fit, single-breasted, to double breasted with notched satin lapel. The most popular design, however, is the two-button notched satin lapel. They also vary in sizes, fabric quality, and styles. Make this Valentine's Day a day to remember by letting us sort you out will a red blazer and equally decent pants. Stop by our stores it hit us online for a chance to browse through our vast varieties and eventually locate the one that will put a wide smile of love and affection on your partner's face in that special occasion. There is no better outfit than royal blue blazer men for a festivity or a casual appearance. It suits men of all age and can be worn at any time of the day. You only need a perfect fabric choice and you are good to go. It's not compulsory that you have to wear it with identical pants thus when worn with the correct outfits compliments the looks. For the best outcome, including a neutral color shirt and a light shaded trouser is required; equally, adding black attire along with it will make you appear fashionable. Mix and match style is the most preferred look that assures you with a stunning mien for every occasion. Formal and funky parties are special occasions and it means alot to attend or hold one. You should therefore dress decently to rise up to the occasion and enjoy every moment in it confidently and comfortably. When you select any of the above-mentioned Blazers, you will surely embrace the party mood and bear an eye-catching look that helps you celebrate in style.